Hundreds of public relations professionals work in federal government, churning out press releases, promotional videos and photos in an attempt to procure a bit of free publicity for the work of our leaders. iGovernment from Esse Quam Videri charges you $2 for the privilege of viewing a small portion of that taxpayer-funded output. 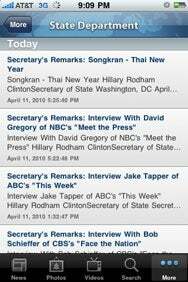 The Word from Washington: iGovernment delivers press releases, photos, and videos from assorted government agencies to your mobile device. This is potentially useful. Government watchers suspicious of media bias can use the app to find full, unfiltered texts and YouTube videos of recent speeches by the president and other officials. But there are bugs: recent “featured news” on iGovernment featured only the first two sentences of a speech given by an American general. And while iGovernment gives you a broad overview of government—the White House, Congress and the Courts—there is a quirky sensibility at work: you can find press releases from NASA, but not from Cabinet-level agencies like the Environmental Protection Agency and the Department of Education. One other problem: The searchable archives appear to go back only a few weeks. Watchdogs might find it useful to have a comprehensive database of government press releases going back years, at least. Without that context, all iGovernment can give you is what the feds are saying about themselves right now.